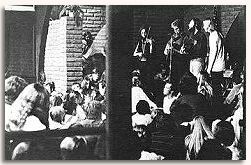 When Chuck Girard, Tommy Coomes, Jay Truax and Fred Field first stepped out onto the Calvary Chapel stage one evening back in 1970, it's not likely that the few hundred people gathered there had any idea they were about to witness the beginning of a new era in gospel music. You don't usually think in those terms when you hear a group for the first time. Now, had you been there, you probably would have come to the conclusion that these four young men who called themselves Love Song were pretty good. Exceptionally good. They played soothing, intensely personal music that spoke to the heart and echoed the timeless themes of God's love. At the same time, it sounded very much like the music the professional rock and folk rock groups were playing. That was perhaps the most intriguing part of it. Music like Love Song was playing had formerly been reserved for the pop airwaves; it had, at that time, no place in the Christian scheme of things. But here was this group, weaving a tapestry of close harmonies, pulsating rhythms and intricate guitar patterns, all tied together with an undeniably clear gospel message. The audience felt something vibrant, something fresh, something uniquely positive about this music. For the moment, it was beautiful praise music befitting the atmosphere; beyond that moment, the newly conceived sound was to become the forerunner in contemporary gospel music.